Recently, I've been having a few problems sitting at my painting desk. 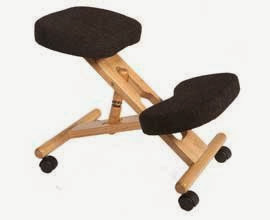 For the last ten years or so I've used a kneeling chair like the one shown below. It's really good for 1-2 hr painting sessions without putting a lot of stress on my back. As regular readers will know since 2008 I've had significant problems with my left leg. Once I'd recovered from tearing my Achilles I started a long period of rehabilitation and physiotherapy to restore fitness and function. This went well, if a lot slower than I'd hoped, until early 2012 when I was diagnosed with a problem that needed surgery on my left knee. I had the operation in March this year and I've been in "rehab" ever since. As an aside I've learnt that being over 50 means that things take far longer to mend. In my case this means everything is taking months not weeks. What's this got to do with painting I hear you ask? Well the amount of gym work I've had to do to get my knee strong and stable has been immense! It's involved so much exercise that I can't use my kneeling chair for more than half an hour without my legs stiffening really badly. More importantly the action of kneeling for longer periods leaves my left knee sore for days afterwards; so much so it's been difficult to know how the rehab has been progressing. As a result I've had to abandon my kneeling chair for a standard kitchen chair. The down side is that I get back ache within 40 minutes and I have to limit my painting sessions to an hour with at least an hour between sessions. So I face a choice a sore knee or a sore back. At the moment my back recovers far quicker than my left knee so the kitchen chair is my "seating of choice" for the time being. In the medium term my left knee is getting stronger every week so I hope to return to my kneeling chair, and longer painting sessions, sometime early in 2014. Fingers crossed. You should see if you know someone from whom you can borrow one of those Yoga balls or half-ball chairs to try out. I don't know if it would actually help, but the people I know who use them rave about them. They do take a few days to get used to, apparently. Just had a quick look online and this is an interesting suggestion. Thanks. I suspect I may have to get the knee cushion reupholstered. Thanks for the tip.